A georeferenced image can be enhanced for its contrast, colors, appearance, but do not simply load it into your graphics package (Paint Shop Pro), because you will then loose the Map Map calibration and all the coordinates. Graphics software can not handle georeferencing. For a description of world files, see Annex 2.3. After finishing, you save as usual. 3. 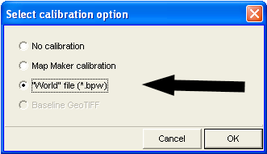 Back to Map Maker, you then convert this (BMP) image back to JPG format with Map Maker calibration: Main menu > Utilities > Bitmap utilities > Convert file format > From BMP > Select folder and file, you just enhanced (Temp) > Open > Save As window > Save as type: JPG > You can select the previous file name > Save > Select calibration option window: Map Maker calibration > OK. Finished.